President Uhuru Kenyatta with President of China Xi Jinping during the 2018 summit of the Forum on China-Africa Cooperation. 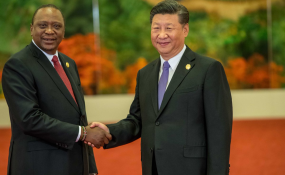 A tweet by President Uhuru Kenyatta on China's $60 billion kitty for development in Africa was met by angry comments from Kenyans. The President is attending the two-day 2018 summit of the Forum on China-Africa Cooperation. In his first tweet on the forum, he celebrated the newly created kitty "as part of new measures to strengthen Sino-Africa ties" . Kenyans who have been urging him to sign the Finance Bill 2018 amendment that will halt the introduction of 16 per cent fuel levy, descended on him for celebrating more loans to African nations when his country is crippling in debt. Some advised that he approaches his deputy William Ruto for loans. On Monday, DP Ruto carried Sh10 million in a bag pack for a goat auction in Kajiado County. @jmwmut replied; "Instead of asking China for a loan, please speak with Ruto. He can fund this year's budget. He is extremely successful at growing money." @Igneous added; "But Mr. President seriously maisha huku Kenya yamekua magumu please don't borrow any more money... We already owe China a lot... Life here is unbearable please." @MangoPeter wrote; "Rather than borrowing from the Chinese who will take away our ports when we default like they are doing in Sri Lanka! & treats us like slaves why can't Jubilee just borrow the money from Ruto's bottomless Money Bank?" @Jess_wanjohi stated; "Our whining is getting us nowhere, Kenya is becoming the most expensive country to leave in Africa, we are getting into debts, more debt and this no one we rescue us. China will be the end of Africa." @hillarybarsong commented; "We don't want the money... Let them keep it... Mafuta ishapanda na Mko Huko mnaongelea Deni zingine... WaChina wabaki na pesa zao hatuzitaki."